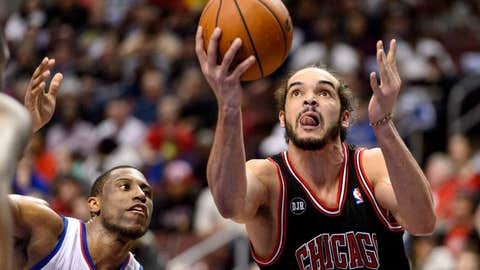 Chicago's Joakim Noah shoots as 76ers forward Thaddeus Young defends. PHILADELPHIA — Down and out or down to the wire, the 76ers are freefalling toward NBA history. "Winnable game," 76ers coach Brett Brown said. "I say that because a group that’s been losing . . . still stays together. They still compete. I’m proud of them." After the Sixers were 3-0 following a Nov. 2 win over Chicago, fans held signs that said, "3-0. That’s No Bull." Sixers center Byron Mullens, who hadn’t attempted a shot all game, hit consecutive 3s to pull the Sixers to 83-80. He made a nifty save on a ball headed out of bounds, leading to Henry Sims’ bucket and a foul. With a chance to tie the game, Sims missed the free throw with 8:19 left. Tony Wroten’s 3 made it 93-90 but it was just more false hope. Carlos Boozer’s emphatic dunk stretched the lead to six and the Bulls did enough to hang on and move to .500 on the road (17-17). "We’re going to get one soon," Wroten said. Boozer had 12 points and 11 rebounds for the Bulls and Noah added 14 points and 10 boards. The Sixers’ solid 11-for-24 3-point shooting was undone by a 9 of 19 mark from the free-throw line. "There is just no inch for error," Brown said. "There’s no wiggle room at all." The Sixers stayed tight and chipped away in the third, making it 64-61 on Young’s 3-pointer. Sims was 0 for 7 from the floor until his first basket cut it to 64-63. The Sixers just couldn’t make the clutch basket or two to finally take the lead. They’d get as close again as two points in the third and trailed only 75-69 at the end of the quarter. "I think Brett’s done a great job with them," Bulls coach Tom Thibodeau said. "They’ve got a lot of moving parts. I give a guy like Young a lot of credit for his professionalism — how hard he plays. They shot the ball well. "I know he’d like to do it," Thibodeau said. "I know how USA basketball feels about him. If he’s cleared to do it, I’d love to see him do it." NOTES: The Sixers are 3-32 since a four-game winning streak ended Jan. 4. . . . The Bulls have won seven of eight against the Sixers.